This is a high-quality product to hold 4 CDs or DVDs in the space of a standard jewel case. By taking our the swing tray it works as a double case. Click to view low wholesale pricing. A super premium quality case for 4 DVDs. A super premium quality case for 4 DVDs including a swing-page. 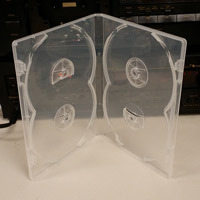 A high quality clear DVD case for 4 discs. This case holds 2 discs on each side without a swing tray. Includes a clear plastic overlay so you can insert a DVD cover.